When I was younger, I remember reading about Helegrod. It offered a sense of foreboding… a 24 person Raid? A huge dragon? Some tough thug drummers at the beginning, and a miniboss prior to Thorog’s entrance, and a dragon that has 346k morale!? It seemed inconceivable to my young self that had seen few dragons at the time, and had never seen anything remotely close. Getting to see him has been on my list since then. I have been patient. Waiting. Watching. Waiting for the right time to take a group to see him. 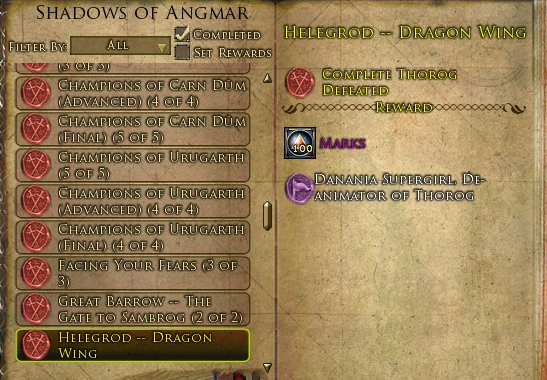 Helegrod has now been separated into 4 wings: the Giant wing, the Drake wing, the Spider wing, and finally… the Dragon wing. You cannot enter the Dragon wing until you have beaten the other three wings at least once. Thankfully, it isn’t on a raid lock; you only have to beat the wings once, and you are eligible from then on. I proceeded on. Onward through Moria, through Lorien and Mirkwood, toward Enedwaith, Dunland, and the Great River. 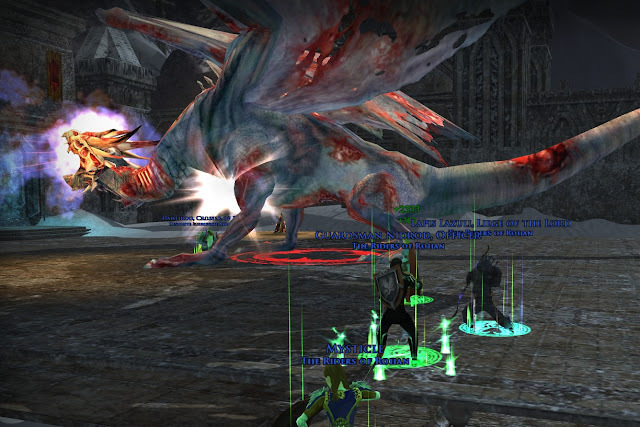 I was even on one of the very early teams to take out another dragon, the always pleasant Draigoch. 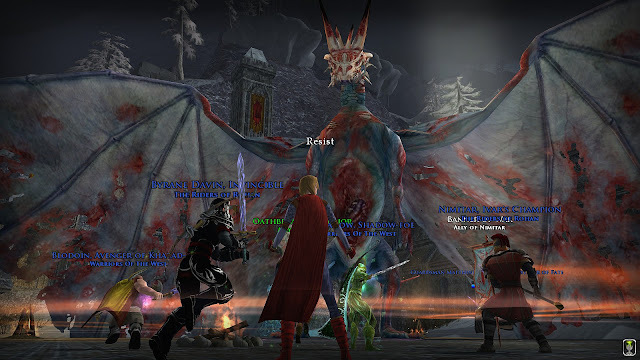 (draigoch-draigoch-spoilers-pictures-of-draigoch) Then, I returned to defeat Draigoch again with only 6 people. That was a special day for me as it was no contest; a win in one try with just 6 of us. Still… Thorog stood steadfast, and I remained patient. My friend Lartessa knew my desire, assembled an assault team, and took us through the first three wings back in April, 2012. 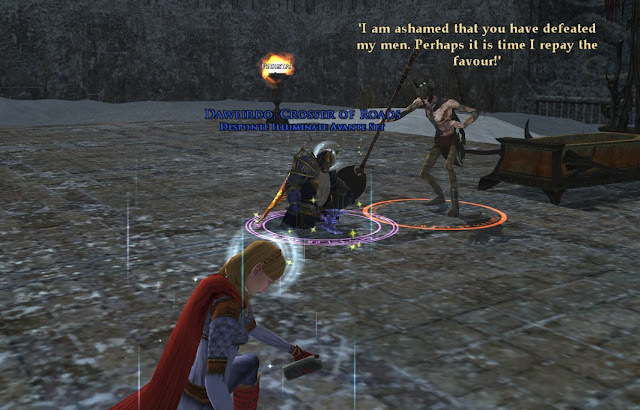 (Happy-5th-anniversary-lotro) However, we were not ready for Thorog at that time on that night. Patience. Waiting for the day I could return. I completed every deed in Eregion. 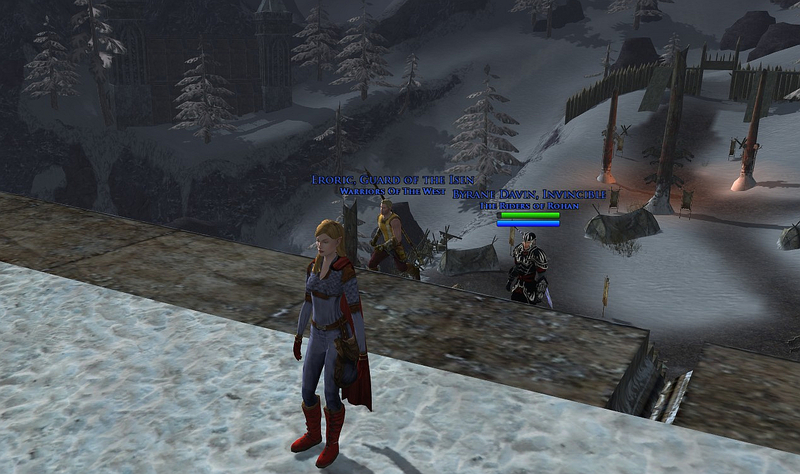 Now only Thorog stood between me and the Meta deed Steed, the Dunedain War-horse, and the title Saviour of Eregion. The wave presses toward the confrontation. Thankfully, the ride to Rohan was delayed! The rangers were unprepared to ride in September, so we were instructed to get our affairs in order for an October journey. For me, that meant deeding, tying up loose ends… dare I say it… defeat Thorog or die trying. I made a plan with my friends in the Riders of Rohan to target Thorog. The date was set but too few had the experience of conquering the three pre-cursor wings. We would need an extended plan. 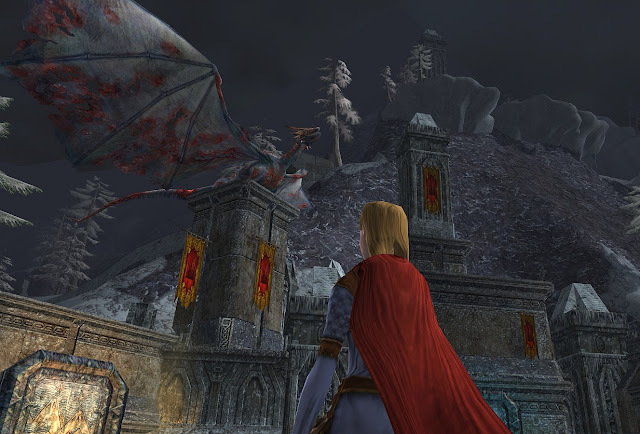 I visited Alti Spiderbane of Archet; he has a blood debt against Zaudra, the master spider of Helegrod. I leave Alti, with his final words weighing heavy on my chest. 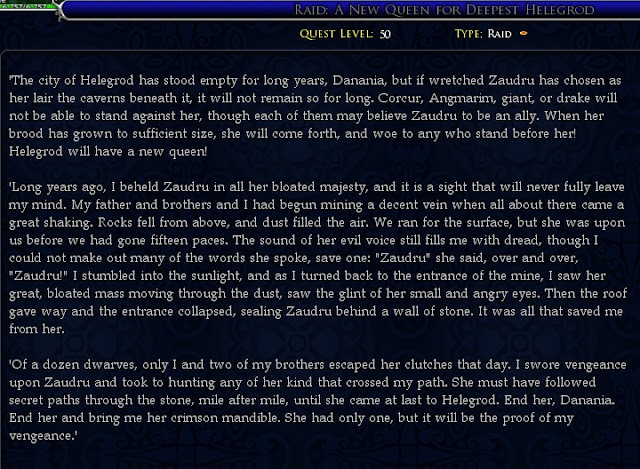 “End her, Danania.” He had suffered losses at her devastation. I hope not to fail him en route to my goal. A few of us grouped with the kinships Ministry and Warriors of the West to advance as many people through the wings as possible. Storvagun the Giant was toppled. The Drakes were dissected. 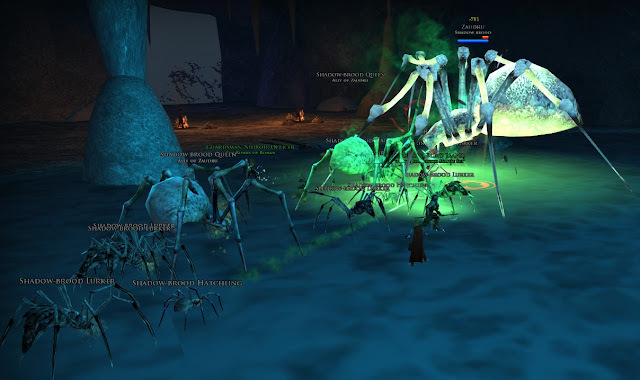 Even, Zaudru the Spider fell, much to the pleasure of Alti Spiderbane. A word of caution when entering Zaudru’s lair… she can poison-one-shot even the toughest foe. The 5-person team of Halj, Mysticle, Nidrod, Reza, and I learned the hard way that hers is no ordinary poison. A hunter with group poison removal is a safer way to beat her. Now, the culmination, enter the dragon. I am giddy with anticipation. Here is the last shot as we have passed the trolls and drummers blocking the entrance, and enter his domain. The snow was heavy on the ground and the sky was grey, foreboding. Drugoth the wight is an appetizer. He tells us how we shall soon be dragon food. THEN, it is dragon time. Actually, the Thorog fight can be fairly easy. Words of caution: let the tank do his thing and if you are not the tank don’t get agro. More importantly, Thorog has a fear that will kill you. One of the fears has a 10s countdown and if not removed, it will kill you and explode and kill those around you. It needs to be potioned away and you need a bit of luck to not get feared again while on CD (or a Captain who is ready to bolster away your fear). During one of the runs, I did get instantly killed but realized what was happening and ran away and died alone so I did not take out the group. Thorog looks almost peaceful sitting up there on his perch. Are we ready team? Sic em Daweirdo! I did get a few good shots during the fight. Here, Thorog is about to let it be known that not just anyone can enter his realm and walk away to tell the tale. Thorog is not happy and is throwing fear and death. You can see my friend Mysticle to the far left with the eye over her head. 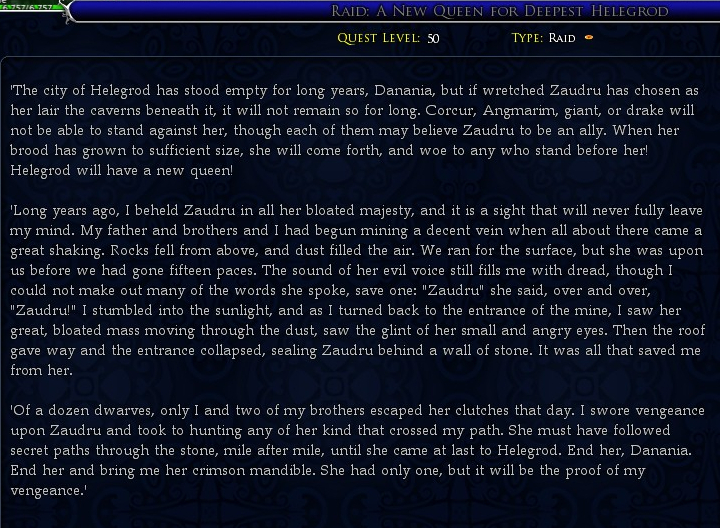 I am thinking this might have been when she got hit with Thorog’s Fear (mentioned above) and is marked for death. Here, Daweirdo tanks Thorog. 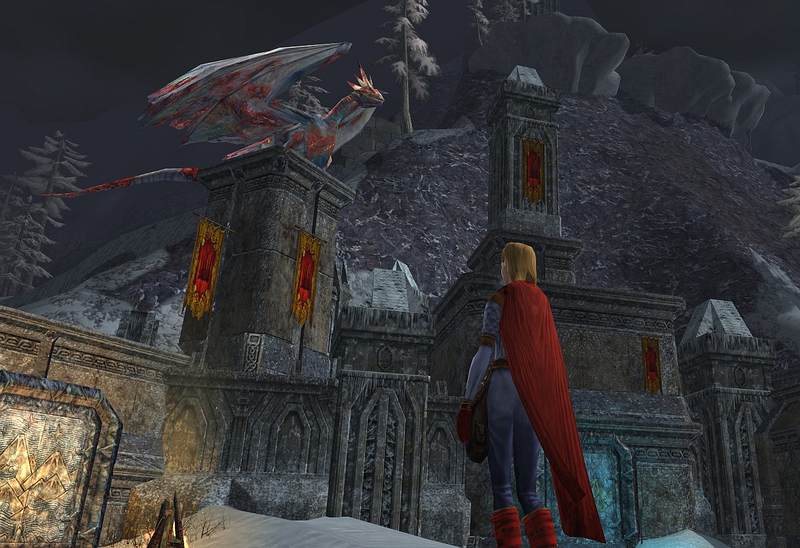 I am glad to be over here… and not over there under the big dragon. In the end, the battle was won! Defeating Thorog has its own special title, De-animator of Thorog. 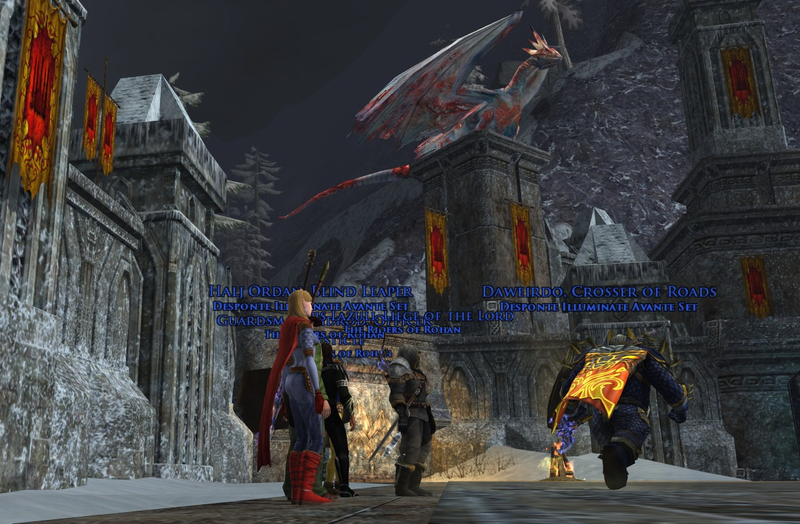 Five deed sets make up the Saviour of Eriador: Barad Gularan, Urugarth, Carn Dum, defeating the Rift balrog, and defeating Thorog. More importantly (to me), I received the beautiful meta deed steed, the Dunedain Warhorse! He is one of my favorites. It was such an adventure, I went twice to get more people completed on their journey. Special thanks to the two groups with whom I went and the many I got to group with along the way. 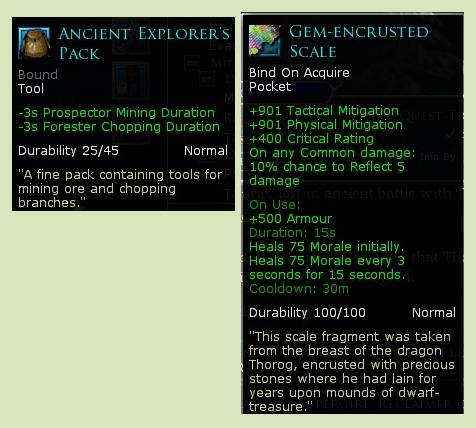 The gem-encrusted scale is surprisingly good for a level 50 item, and compares well versus the scholar crafted pocket item for level 75. Granted, I have a better Great River pocket item, I have never used this Scale and I’m sure it will get tossed but for what it is, I was surprised. Congrats and super, super awesome! Thanks Wynnie, but how do you really feel about Helegrod? lol! Counter to your comment, the Helegrod wings are at least as long as any in OD or ToO and I am very glad they were not lumped together (like the Rift). With the revamp of Forochel, now the only instances that are still 2+ hours to "kill all the things" are probably the Rift and Carn Dum (which have various locks). I will concede though that actually facing Thorog was a bit anticlimatic. If one faces Thaurlach (the Rift balrog) now, he will still kill a good overlevel group if they don't know what they are doing. I didn't feel that same sense from Thorog the dragon (well, except for being one-shot fear killed, lol). Full Helegrod is fun times! Good post. Nice list of quests to do there. I've done Hele on both my endgame toons, but I always forget to pick up all those quests and get the titles associated with the quests. I even had some of the quests on my Warden, but didn't loot the boss bodies to progress... dumb! Forgetting to loot the bodies to complete the quest is the worst! lol!